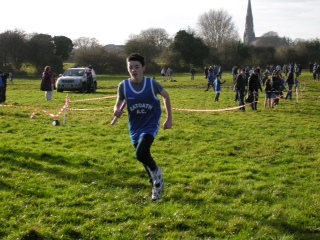 The Meath Cross Country relays were held last Sunday in Trim, the weather held up and the course was in good condition considering the recent wet weather. We had another great turnout from the club with 48 athletes competing in 12 teams from U10 to U16, and it was great to have girls competing this year in the U14 and 16 age category, which was something that we hadn’t achieved in recent years. The competition was of a very high standard this year with 53 teams competing over the 8 events. The girls U10 teams got the day off to a great start, we had two teams competing in this event, our blue team consisting of Aoife Rutherford, Aimee Doherty, Ciara Coffey and Ella Healy took gold, while our orange team made up of Molly Keane, Grace Mahon, Sinead McCarty and Eno Okomo finished 8th. The boys U10 found the competition tough, but competed well and our blue team consisting of Tom Kilgannon, Fionn Drummond, Nathan O’ Connor and Brian Kiely finished 4th, while the orange team of Kyle Witter, Jed Walsh, Rohan Wardick and Adam Carolan finished 6th. 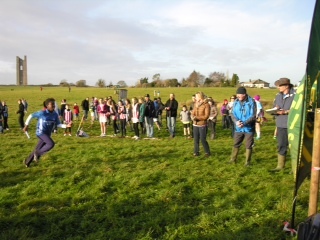 We had four teams also competing in the boys and girls u12 relay, the girls U12 blue team of Ivie Okomo, Karen Hayes, Emma Coroner and Shauna Coffey finished first after a close battle with Dunshaughlin, our orange team of Rachel Doherty, Orla Hayes, Rachel McPartlin and Zara Kane put in a very good performance also finishing a close fourth behind Fr. Murphys. Our boys under 12 blue and orange teams put in a good performance in a very strong field finishing 5th and 8th respectively, well done to Fergal Kilgannon, Adam Howley, Jack Farrell, Oisin Farrell, Darragh Casey, Kevin Dat Conway, Harry Haskins and Tomas Brady. The U14 girls race was the race of the day, with a blanket finish between Na Finana A, Na Finana B and Ratoath, Leah Farrell who ran the anchor leg took the batten about 20m behind the Na Finana teams, but caught up to level with them in the home straight, after a neck and neck battle down the home straight Na Finana A, and B just edged ahead on the line, with Ratoath finishing 3rd. This was a terrific performance by our girls who were up against Leinster and All Ireland medallist from Na Finana. Well done to Leah Farrell, Lua Henderson, Shauna Coffey and Aine O’ Connor on a great race. The boys under 14 team consisting of Garret Doyle, Cormac Butler, Alex Hunter and Brian Kiernan put in a strong run and finished a close second behind Tara, the boys u16 team of Peter Kilgannon, Ciaran McCarty, Ivan Mather and Philip Marron also finished a close second to Cushinstown while the girls U16 team of Dierdre Healy, Shona Quigley, Amber Roche and Ceile Duncan finished 3rd. Thanks to Meath County board and Trim Athletic Club who put on a great event and thanks to all our athletes who took part and parents that made the journey to Trim yesterday. Happy Christmas from Ratoath Ac to all our members.